'Iao Valley is a treasure that is easily accessed by anyone. While most people don't spend an extended period of time here, it is a must-see. In a nutshell: ‘Iao Valley is a treasure that is easily accessed by anyone. While most people don’t spend an extended period of time here, it is a must-see. Minuses: Official trails are minimal. Not a whole lot to do for most visitors after you’ve seen the main attraction. 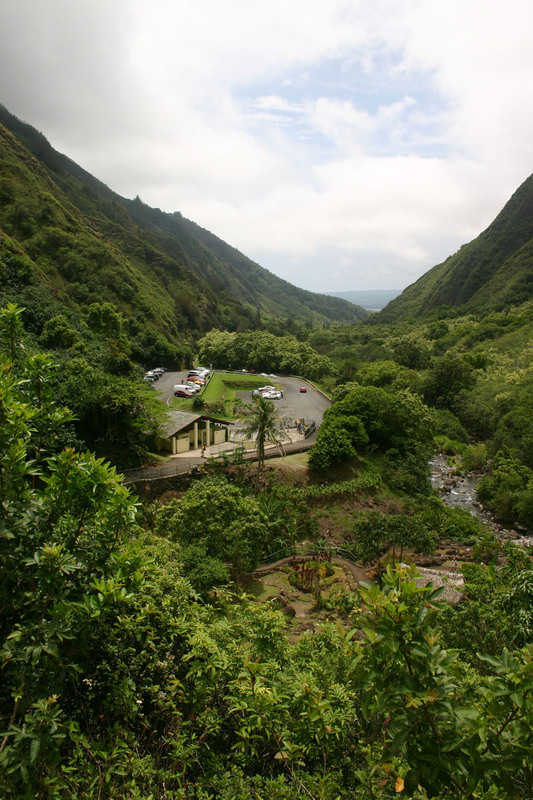 ‘Iao Valley State Park is on virtually every guidebook and tourist pamphlet’s short-list of must-see places – and for good reason. It is easily accessible by car or tour companies, has paved walkways, steps, and signage with historical information. It is also dramatically scenic and particularly well suited for older folks and kids. The second wettest place in Hawai’i (the wettest, on Kauai, is also unofficially the wettest place on earth), the summit of the valley receives an average of over an inch of rain per day. (that isn’t an inch every day…maybe it’ll rain seven inches the day before your visit and take the rest of the week off!) Much of this water flows into the `Iao stream – and virtually every drop is drained by a massive diversion that Wailuku Water takes off just outside the park. The main attraction here is the ‘Iao needle (Kuka’emoku) – a 1200′ (2250′ from sea level) high peak created by erosion of the softer rock around it over many millennia. In Hawai’ian culture, it is known as the phallic stone of the god of the ocean (Kanaloa.) They must not have wanted to share this view when they erected the lookout deck – because any normal person will wonder what kind of Freudian case-study thinks of a phallus when they see this scene. But if you look from a different angle (hint: parking lot) you can see a much clearer (if less impressive) view of the whole package. This valley is sacred and was kapu to all but Hawaiian royalty. 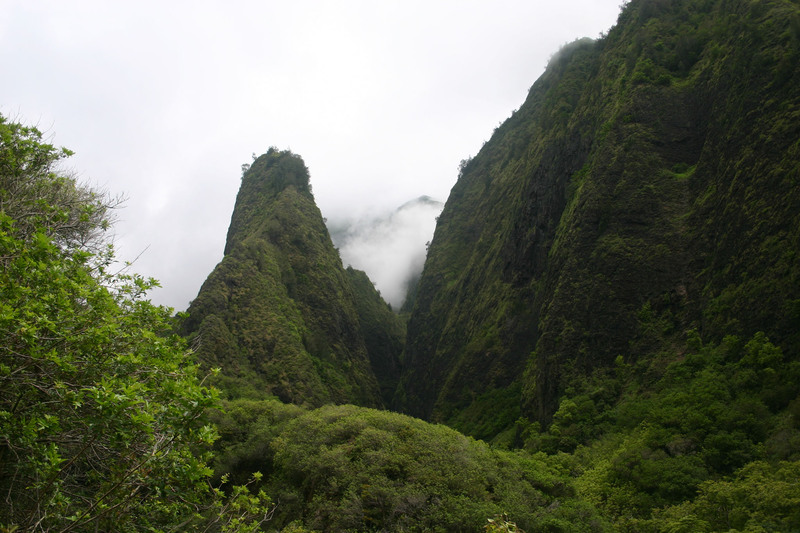 The sheer, inaccessible cliffs in `Iao Valley were used as a burial site for Hawai’i’s ali'i for centuries. Ancient Hawaiian’s believed that their bones contained their mana. Desecrating or stealing bones could give power, control, and even cause harm to living descendants. Heading back up to the foot-bridge, you’ll typically see local kids jumping off into a small pool below. Like most teenagers, they may come off as too cool to pay attention to you, but they’re most definitely there for your attention. (There are plenty of better jumping options close by if they didn’t want a steady stream of tourists walking by as witness to their coolness!) So feel free to observe, yell some encouragement or even throw ’em a shaka! 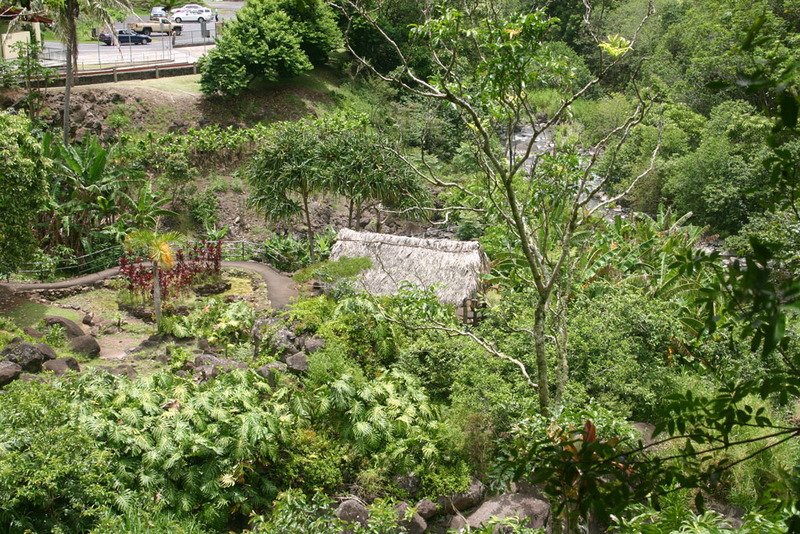 On the road through ‘Iao Valley, and before the State Park there is also the Kepaniwai Park Heritage Gardens. The gardens memorialize the multicultural history of Maui, with buildings and gardens representing Hawaiian, American missionary, Chinese, Japanese, Portuguese, Korean, and Filipino cultures. The gardens were restored in 1994, and are a nice place to stroll around, and have a picnic lunch. Next door to the Kepaniwai Park Gardens is the Hawai’i Nature Center. Unfortunately the museum has been permanently closed to walk-in visitors. Will it be open during the first week of September 2018? Any way to know if this Park is open now? Kudos to whoever writes these…pretty great paragraph about the “main attraction”. Iao Valley State Park is closed until further notice. We tried to go today and there is a police officer at the road to ensure that no one goes in. Apparently there was major floodinga few weeks ago and the cop says it will not open “for a few months.” If you plan to go to the park find a way to make sure it is open before driving there. I wasn’t able to find anything on the website, and I couldn’t find a phone number. We also tried to go to the park 2 days ago and it was still closed. No information about when it will be opened. Sad. We are bitterly disappointed. 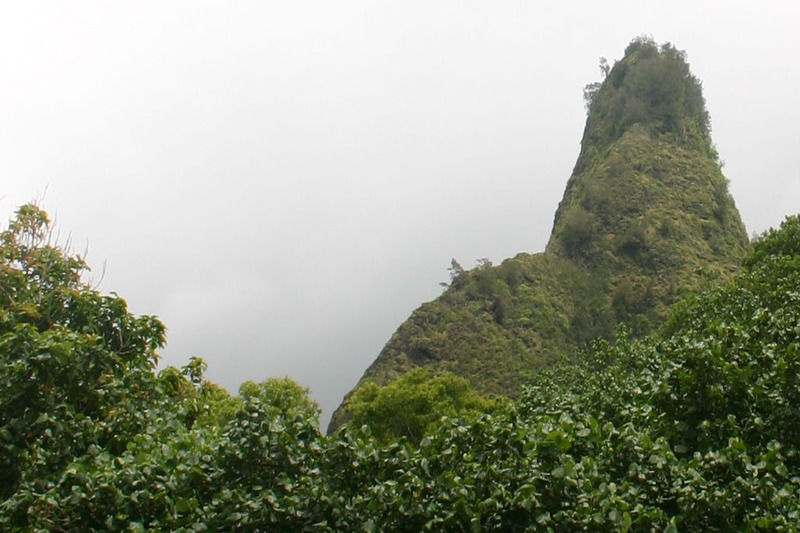 Why didn’t ‘Iao Needle erode ? Just too mention that you have to pay the $5.00 entrance fee by credit card! Bizarre!! In 1963/4 I walked up the valley to the parking lot at the Needle. I was 20 at the time so it was an easy climb. Does anyone know the history of the swimming pool in Heritage Park in the Iao Valley? In 1964, just across the street from Heritage Park, was the Iao Valley Inn. It was a small hotel with a restaurant and cocktail lounge. It also had a swimming pool in the front just above the road by the park. Maybe this is the pool that you refer to. I haven’t been there in over 30 yrs. so I don’t know what it is like now.